Meditation Question: How can I visualize gold energy? Hello everyone! This is the very first blog post of this blog, which is dedicated to meditation, personal growth, self-healing, etc.! :-) I want to invite everyone to send me any question you have that you'd like answered here. You can post your questions & comments below. So the other day a new phone reading client who had been meditating with my meditations on and off for a few weeks asked me "In your meditations you often mention using gold healing energy. I am having trouble visualizing the color gold." Well first of all, good for you for being able to visualize any color at all! I started meditating in college, 1988-1992, which makes me 45 now to spare you the math! Back then all I could see was the color black, everywhere. No forms or shapes- nothing. I don't think I expected to see anything anyway, and was just meditating to feel better and since it worked for that I stuck with it. Then a few years later when I heard about visualizing your energy and that all energy had color, I still could only see black with no form or shape. I kept meditating and eventually I could see black with some form and shape, then some bits of color. I learned that energy that is a gold color/vibration helps one to let go and heal. I wanted to visualize the color gold when I was meditating too, even though it's not actually necessary. If you create gold healing energy with your intention then you really did it, regardless of how well you can see it. Creating is what you do with your intention or thought; visualizing is more of a fun confidence-boosting extra where you can watch what you are doing. That is why in my meditations I try to say many versions such as "create, imagine, or visualize" since it all works. So back to my early 20's when I was definitely wanting to visualize gold energy, but couldn't do it at all. 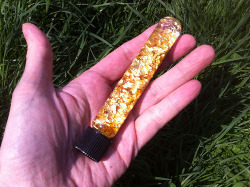 What helped me was to buy a little test tube with gold leaf suspended in water, and hold it or keep it visible when I meditated. Every once in a while I'd open my eyes and stare at the gold color, then close my eyes and try to see it in my mind. I remember doing this over and over. It took time but it did help me to be able to visualize the color gold, at first for just a few seconds. If you are in the Chicago area you can get gold leaf in a little glass ball or test tube at Dave's Rock Shop in Evanston, IL. Now I have four cats that love knocking things down, so I also have a plastic little container of gold glitter, which I hope can survive a fall more easily. I keep it on my desk because it's still helpful and fun for me to see and hold a visual example of the color gold. 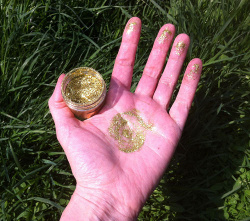 In this photo I show with glitter where the hand chakra is in the palm of each hand, and also fingertip chakras in the tip of each finger! Hope this helps and keep the questions and comments coming! If you want to comment only as a guest, type your comment in the comment line, put in a fun name or your name & any email at all, then check the box for I'd rather comment as guest. I review all comments before they are posted.